Like most young girls of the past 50 years, I had a Barbie doll as a child. Modern arguments against Barbie have come out against the plastic toy as setting unrealistic body images for young girls. The bodily proportions of the doll, nearly humanly impossible, are said to cause girls to critique their own body image against that of a 12” piece of tan plastic. I have no doubt that this is indirectly related to the widespread self-esteem issues and eating disorders experienced by many females. But to stop at the face of the issue, the perfectly tan, always made-up face of Barbie, doesn’t diagnosis the wider spread epidemic. Barbie is a culmination of all the aesthetic and philosophical beliefs about women brought about through thousands of years of Patriarchal rule. Perfectly tan, tall and leggy, Barbie is the perfect match for her male counterpart, Ken. Barbie’s interests include: shopping, fashion, cooking, and driving in her convertible. 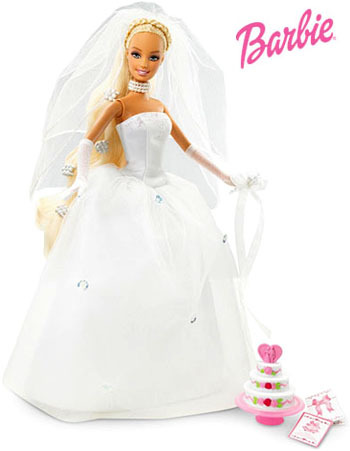 The career options opened up to Barbie have always been, to my best memory, scarce. As a child, I remember that Barbie did a lot of shopping, and I think I eventually she became a teacher. Eventually I think I recall a “doctor version” of Barbie coming out, which entailed throwing a (stylish) white lab coat on the preexisting Barbie, and calling it a day. This argument isn’t to meant to be an angry feminist rant about the evils of Barbie (although it could easily be translated into one). I know many people who will tell you “I played with Barbies as a child, and I turned out just fine”. I think that’s a perfectly fine statement. I don’t even think the plastic dolls themselves are what I am directly arguing against. What I am questioning here is the production of a toy, clearly marketed toward a specific gender, that is so widespread that it can be linked to such large corporations as Nascar and even the Girl’s Scouts. This iconic toy has entertained girls for decades, and along the way caused quite a bit of controversy. My contention is not in the doll itself, but the historical and symbolic tokens of femininity that she portrays. The aesthetic experience of women as objects to be dressed and made-up (in fashionable high heels of course, because Barbie’s feet are permanently distorted to only fit into high heels). While we encourage young boys to play with dump trucks, legos, and experiment with robotics, we must realize that this phenomenon of “engendered toys” is harmful for everyone involved.